Although this club dates its existence under its present title from the year 1875, it can claim to have had a connection with yachting and sailing for a longer period than that indicated by the above date ; many years previous to which, the Old West Quay Amateur Regatta Club (of which it is an offshoot) had its head­quarters in Tom Stockhain’s premises at West Quay, and frequent races were held under its auspices in the waters just opposite, where many an amateur sailor won his first gem. 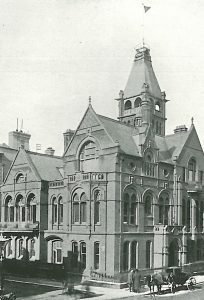 It was in 1875, however, that a sort of division took place amongst the members, resulting in the removal of a large number of them, who constituted themselves into ‘The Southampton Regatta Club,’ occupying rooms at the George Hotel, which, however, was soon after destroyed by fire, and the club then removed to other premises in High Street, which, strange to say, were also burnt. Rising, however, like the phoenix, its position became more firmly established, and in 1875 it blossomed out into a yacht club, having obtained by Admiralty warrant permission to be styled ‘The Royal Southampton Yacht Club,’ which title had been in abeyance ever since the year 1844, when the present Royal Southern Yacht Club (originally started as the Royal Southampton Yacht Club) changed its cognomen. The year 1885 marks a very important era in the history of the club, for in April of that year the foundation-stone of its present commodious club-house was laid by the Commodore, the Marquis of Ailsa.